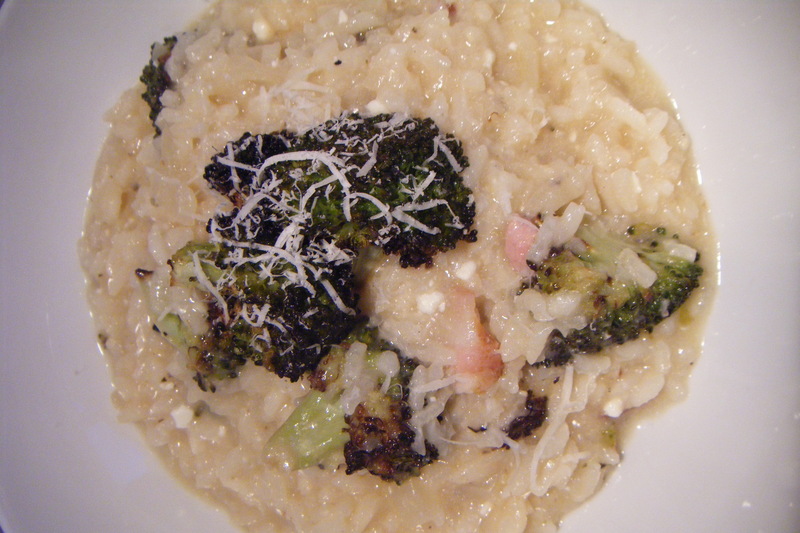 Roasted Broccoli Risotto, a total surprise! My holidays are finally near… Since I started my new job last November, I have not taken a holiday. We have taken short trips on our weekends but a whole week of no alarms and no work is going to be total bliss. D and I are travelling to Poland for his sisters wedding. I am super excited to see how a Polish wedding differs from the Irish. I have been warned about the copious amounts of Vodka and the three day event that lies ahead. I have even practiced my chicken dance and musical chairs as this is part of the entertainment for the wedding. I just hope my little feet can keep up with all the uncles that are apparently going to want to dance with me due to the fact that I am ‘exotic’ in their eyes (an Irish girl that doesn’t speak Polish). So in two days we fly away but before that I want to use up the contents of the fridge and write the new recipes. I can feel already that while I’m away I will miss my new found love of blogging (I am totally obsessed and find myself dreaming about cooking), but fear not peeps, I will find some wonderful inspiration from Poland and hopefully I can finally get my hands on D’s family recipe for Barszcz. My father loves loves loves it apparently and wishes that I make it for him. I have already had a lesson in the art of Pierogi making from D’s wonderful mother but in all honesty I have not made it as of yet because it’s the one dish I love and don’t want to ruin, so I will just have to eat as much of it as possible while over there. Right onto business: Last nights dinner was scrumptious! 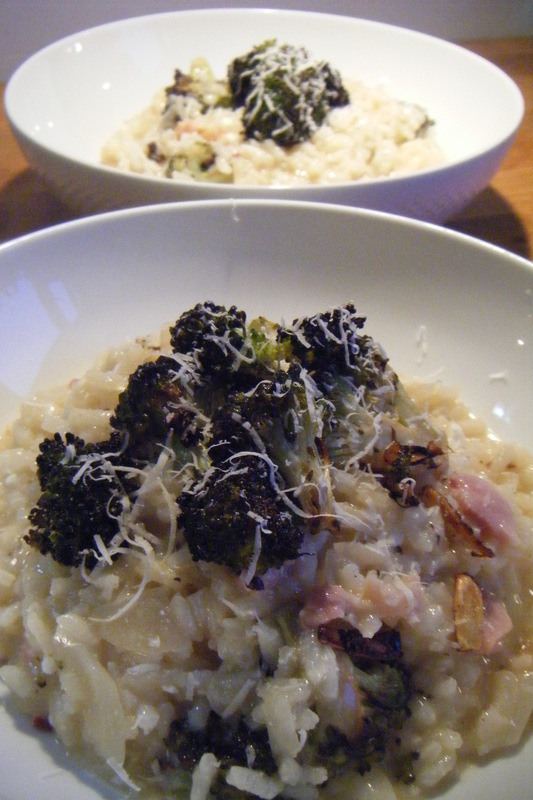 I had a big head of broccoli and left over streaky bacon (from tomatoes galore) and just enough risotto rice to feed two (well it would feed four normal people but with D and myself we will forever go up for seconds). Preheat oven to 160 °c (fan oven) or gas mark 3. In a bowl mix the broccoli florets with the oil, salt, lemon juice, garlic and oregano. once the broccoli is coated place on an oven sheet and bake for 15 minutes. Remove from the oven and leave aside. Meanwhile in a large pan add the oil and fry the bacon until lightly bowned, add the onion and cook for 2 minutes until the onion is coated in the oil and slightly translucent. Add the rice and stir for a minute. Add the wine or vermouth and stir until absorbed. Pour in 2 cups of the stock. Stir every few minutes and once the stock is mostly absorbed add in another cup. Continue until all the stock is used and the rice is soft with a slight bite. If you need to add more liquid then do. Risotto is in my opinion never an exact science. Remove from the heat and stir in a knob of butter, the cheese/cheeses and 3/4 of the roasted broccoli. Taste and season with freshly ground black pepper. Cover with a lid and leave for 2 minutes, this helps make it creamy and oozy. Plate up and scatter the remaining broccoli over the top and sprinkle with oregano (I find that if you rub the oregano between the palm of your hands it brings out the flavour and scent).